The DivX Create Bundle includes DivX Pro, DivX Player, the DivX Web Player and the DivX Converter, giving you everything you need to create, play, manage and burn DivX videos. With the DivX Converter you can convert your videos to DivX in one easy step. 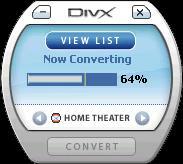 Simply drag your videos onto the DivX Converter and click 'convert.' Videos created with the DivX Converter will play back on millions of certified devices. DivX Player lets you play all DivX videos. Every version; even purchased or rented DivX movies, DivX HD files, and videos created with advanced features such as menus, subtitles and more. It also lets you create playlists, manage video collections, burn discs and activate your DivX Certified devices. DivX Web Player is a versatile utility that allows you to embed DivX videos directly on to a web page. 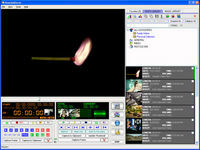 Also included in DivX Create is DivX Pro, an advanced digital video codec (coder/decoder) that plugs into popular video software applications. When used in combination with your existing video software, DivX Pro allows you to create and play high-quality DivX videos and provides playback support for interactive video menus, subtitles, alternate audio tracks and more. DivX technology can compress digital videos 5 to 10 times more than the MPEG-2/DVD format and hundreds of times over raw digital video. The DivX codec 6.2 offers multi-threading support, giving you better performance on all HyperThreaded, dual core and dual CPU (SMP) systems. Depending on your system configuration, you can get up to 350% better performance than DivX 6.0 when using the higher quality encoding modes. Only have a single CPU? Don?t worry ? we haven?t left you behind. The latest version of DivX is significantly faster than 6.0 across the board.